Pure Crabbet horses occasionally trickled out into the world during times of family feuding and economic necessity (necessary even for rich royalty!) - including to America, namely to the Maynesboro stud in 1917, and the Kellogg Arabian Ranch in California in 1920 and 1936. This is where the Crabbet-Maynesborough-Kellogg - CMK - lines in America eventually came from. The Crabbet stud was once again flourishing when Lady Wentworth died in 1957. The estate and horses passed on to Cecil Covey, the son of Lady Wentworth's stud manager. To pay the 80% death taxes on the estate, Covey had to sell almost half of the stud's 75 horses. 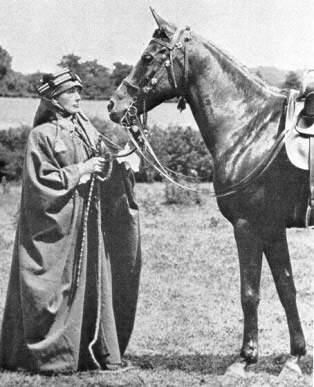 The American breeder Bazy Tankersley and her Al Marah stud ended up with 32 of these purebred Crabbet horses. The Crabbet Park Stud continued to run successfully once again for 12 years, until Covey found out that the government was going to build a highway from London straight through his property. It was too much for Covey at his age to start all over - and one of the saddest of all tragedies in the horse world occurred: after 93 years of selective breeding and history, the Crabbet herd was totally dispersed into the world in 1971. The Crabbet horses didn't disappear, and though the carefully selected breeding program dissolved, and many Crabbet lines were subsequently lost or diluted, a few breeders continued to carry on the pure Crabbet tradition. Seren Arabians is one of these in the United Kingdom. Over 90% of today's Arabian horses in America has at least one ancestor that traces to Crabbet horses. Today, as then, Crabbet horses are known for their even temperaments, hardiness, and athletic ability, carrying on the characteristics that were cultivated and refined over 100 years ago.